The National College of Arts has maintained a visionary approach to the arts. As the oldest institution in Pakistan, it remains one-of-a-kind. From an industrial polytechnic in 1875, to a contemporary arts college starting with three major departments in 1958, the college today boasts an impressive seven departments, all of which contribute to Pakistan’s professional communities on an annual basis, the best artists, architects, designers, ceramicists, ﬁlm makers, cultural researchers and musicologists the country has to oﬀer. Our undergraduate, graduate and post- graduate courses have proved the test of time. The eﬀorts of NCA’s faculty, students and alumni have received national and international acclaim. The rigorous curriculum, dedicated faculty, as well as the geographic and socio-ethnic demographics of the college make for a strong and progressive student body, which is well- prepared to enter its chosen ﬁeld. Faculty and staﬀ on both the Lahore Campus, situated on the historic Mall Road, as well as the Rawalpindi Campus, at Liaquat Memorial Hall, strive to provide students with cutting edge techniques, and engage in contemporary discourse. Apart from the rigors of the college curricula, the students engage in extra- curricular activities, often displaying professional levels of achievement. Sport is also a popular activity at NCA, engaging even the more avid faculty and staﬀ. Today, I am proud to announce the expansion of NCA’s activities, as well as its physical expansion into the Federal Area. As recognition of NCA’s eﬀorts to promote progressive ideals and maintain standards of academic excellence, at a time when the country was tackling some of the hardest of times, the Government of Pakistan has allocated an auditorium and adjacent halls in Islamabad’s central G-6 area. The facilities will be used for exhibitions, ﬁlm screenings and short courses, and will be available to the general public as well as the government’s organization and foreign missions. 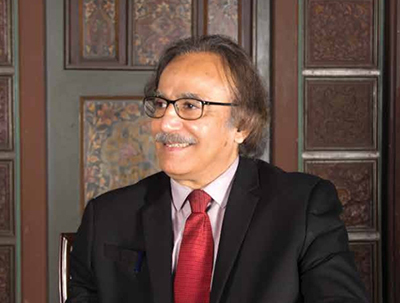 I, along with my faculty, take great pride in our contribution to imparting knowledge and encouraging productive, creative individuals who contribute to the artistic enrichment of Pakistan. It is in this spirit that I invite you to be part of this unique place of learning.